← How do you let go of the suffering of others? Emotional tears are a release of tension that has built up in the body. It is as if our emotions are spilling over, and in the process, washing us clean. So in that sense, tears are beneficial, a welcome way to release hurts and feel better. Tears are a form of emotional self-medicating (and probably a lot healthier than booze, pills, or binge eating). An important first step in healing is the willingness to feel your feelings. But where do you go from there? Release of emotion does not solve the underlying crisis or instantly transform you. Crying is also pretty darn exhausting. Tears are a symptom of intense emotion. But we must dig deeper – to the cause – to cure any dis-ease. I have come to believe that all tears of sadness are a form of self pity. Now, that may sound harsh, but I say this as a fairly recent widow who has done her share of crying recently. I don’t encourage anybody to suppress or repress the urge to cry. I simply want to understand the cause so that I can be more mindful in my life and find ways to experience less sadness. Awareness is the therapy. When you understand what’s going on, you gain the power to change it. Fundamentally, tears are expressing that I want something to be different in my life. I cry because I believe that something is wrong. I am resisting “what is” – the reality of what is happening here and now. I want something else, and when I can’t get my way, I cry about it. In my case, I want my husband to still be alive. I want things to go back to the way they used to be, and when that can’t happen, I feel sorry for myself. Tears are about the past or the future. They are not about the present moment. We want to return to the past, when we felt safe and comfortable. We have fears about the future – what will become of me? Your feelings are based on your thoughts – and your sad thoughts are about the past or the future. If you were truly in the absolute NOW, you would be totally present to what is currently happening in your life, instead of your wishes about the past or fears of the future. You would be enjoying the sunshine (or the rain), seeing the flowers (or the trash), and relating to the people who are around you right now (or talking to your deceased husband) without wishing anything to be any different than it is. The true NOW is a very tiny slice of time, smaller than a minute. Living in the true NOW is experiencing life moment to moment, thought by thought. There are probably only a few Masters on the planet who can do that all the time. The rest of us stumble toward the light, as we glimpse the vision of how life would transform if we did. No worries – we’re all doing the best we can with what we’ve got. Life is not a contest, and each of us is unfolding at our own rate. 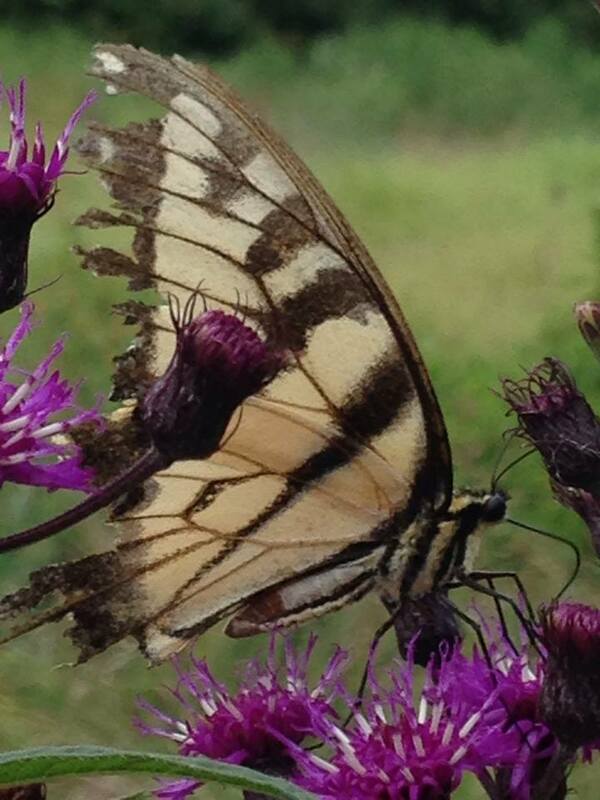 This butterfly is worn but still drinking in the nectar of life! But what about tears from being in physical pain? Physical pain is a signal to wake you up to the fact that something is wrong in the body. If you tell your body that you’ve got the message, often the pain will lessen. If I am lying in a hospital bed in pain, there is emotional pain caused by my fear of what the disease is doing to me and whether I will survive. But what if I could learn to define my physical experience as “sensation” instead of as “pain”? What if I took all the emotional juice out of the experience? What if I could stop resisting that particular sensation and just allow it to be my experience for now? Personally, I can’t tell you whether that works. I think it’s Graduate level coursework in the School of Life on Planet Earth, and I doubt that I would do well in that class! I think he was “working” with the pain, embracing the experience, using his energy to keep his mind in such a tiny slice of the present that he could define it as a sensation. You see, we so easily forget that life is a gift. We are surrounded by wonders and blessings all the time, but we don’t focus on that. When you had a missing tooth, where did your tongue go? It just had to seek out that empty spot. Noticing what’s missing is probably encoded in our body as a survival mechanism. But we have the ability to rise above merely surviving to a life of thriving. When we experience loss (and we all do eventually), we let our attention get caught up by what’s gone instead of what’s here. Instead of celebrating what IS in our lives, we let ourselves get mired in the missing. Different is never completely ALL bad (or good.) Different is just… well, different. You will like your life a whole lot more if you learn to find the positive, to feel a sense of gratitude, and to enjoy whatever is there for you. So the next time you have a good cry – and please, please, please go ahead and let it out – let a thought also creep into your consciousness that you are probably clinging to the past or fearing the future. The past is gone. It’s over, it’s been done, and it cannot be fixed. You have no power to change it. Your power lies in moving on. The future never actually arrives. Your thoughts of the future can be fearful imaginings or wondeful visions. Your power lies in choosing what steps you will take to create your next chapter, your new normal. All you really have is the present. And you can handle that. Yes, you can. The proof is that you are alive, you are breathing, you are still here. And if you can let go of just a little bit of your emotional baggage, you will rise more easily and dance more lightly through your life. This entry was posted in Uncategorized and tagged death, divorce, grief, Lyte, Lytingale, mindfulness, pain, suffering, tears, Unity. Bookmark the permalink. Great Post. All in life is a gift…just some comes in crappy wrapping paper. Thank you, Lyte, for your words and for your thoughts. They make a lot of sense to me. They bring me peace. I too have experienced a lot of grief recently, and you express a lot of what I believe about grief, tears, and where the focus of our life lies.